It’s no secret that any construction project will regularly require hauling of materials on and off site. When you need a heavy-duty truck rental, look no further than Millican Crane Service. We have nearly 20 years of experience providing the Olympic Peninsula area with incomparable customer service and a dependable fleet of vehicles that you can rely on to get the job completed on schedule. Whether you work on light residential home building or large-scale commercial projects, we have the perfect solution for your hauling and trucking needs. 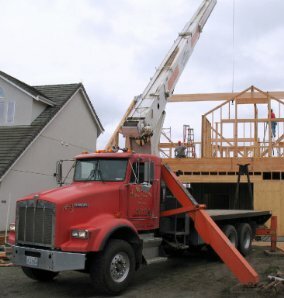 Whether you need an all-purpose pickup truck rental or a flatbed truck rental for increased ease of loading and unloading oversized equipment, Millican Crane Service has it all. We offer a convenient mobile service, delivering our trucks directly to your jobsite. We do not offer bare rentals, though you can rest assured that every truck you rent from us comes manned by a highly trained heavy equipment operator to ensure that tasks are carried out with precision and efficiency. Whether your construction project is large or small, you can count on our professional and courteous staff to help you pick just the right truck rental to suit your needs. At Millican Crane Service, we are dedicated to providing you with heavy-duty equipment and top-notch customer care at a great price. Our staff will work closely with you to make sure that all of your needs are met. The right equipment at an affordable rate is just a phone call away, so dial (360) 930-6685 today! We are a trustworthy equipment rental company with a strong reputation. Get started on your next project by requesting a free estimate. Call today to learn how we can help you complete your next project. Millican Crane Truck & Crane Service. © 2018 All Rights Reserved. Providing Seattle, WA with the the best in heavy rigging equipment.